The diameter of the nylon dummy ribbon and high density seed are 0.85mm and 0.5mm respectively. Nylon Dummy Ribbons are also available with seed lengths of 0.6mm, 1.2mm, 1.8mm, 2.4mm, 3.0mm, 4.0mm and 5.0mm. NOTE : Custom-made Dummy Ribbons are also available. 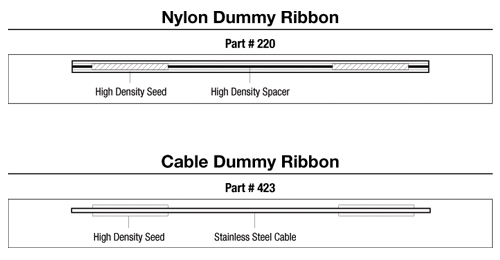 Cable Dummy Ribbons are similar to the Nylon Dummy Ribbons. The diameters of the cable and the dummy seeds are 0.5mm and 0.85mm, respectively. Custom made Cable Dummy Ribbons are available with or without alternate markers using seed lengths of 0.6mm, 1.2mm, 1.8mm, 2.4mm and 3.0mm. This enables identification of ribbons in complex implants, facilitates implant radiography and improves localization accuracy. Dr. Lowell L. Anderson of Memorial Sloan-Kettering Cancer Center and Mr. Bruce Forell of City of Hope Medical Center have been very instrumental in bringing about this design concept.